I spent a couple of days at Summer League this year and got to see only one Spurs game, but I was able to catch lots of other games before I left and here are some random observations. Ding Yanyuhang is a rookie on the Mavericks Summer League squad, and he’s a real crowd favorite. When he first entered the game, he elicited cheers from a core group of fans. After a while, the rest of the arena joined in, and whenever he took a shot, collected a rebound, or even touched the ball, the crowd erupted into cheers, and chants of ‘MVP, MVP, MVP!’ could be heard. I’m not sure I understand it, but it was fun. I don’t think he looks like a guy who can make the regular season squad for the Mavs, but he’s definitely a hustle guy and he’s fun to watch. If you remember my article from a couple of years, back, a lot of it was focused on the insanely hot walk from the hotel to the arena. This year was more extreme, because I was stationed at a hotel a couple of miles away, on the Las Vegas strip. But I was in much better shape this year, and I made the walk in about an hour, with an air conditioning break midway at the Hard Rock Hotel. Nevertheless, on my last day, I had to trek back to my hotel in the middle of the day in the 110 degree heat. I brought lots of water with me, and I actually felt fine until I sat down at the airport and noticed the seat was vibrating. I think this was the point in ‘Fear and Loathing in Las Vegas’ when Hunter S. Thompson’s drugs kicked in, but it was really just my cooked body rebelling on me. Luckily, the flight out was short. Nothing felt as good as the shower and bed at the hotel on my next leg of the trip. I wanted to get some great photos on this trip, but the rules at the Thomas & Mack Center were a little more strict than they were a few years ago, and I couldn’t bring in my professional camera. But I did take a few nice shots with my cell phone like Joe, the Bucks fan with a 2 ft tall Mohawk. Probably the best part of the trip was meeting with Bruno Passos, who really impressed me. He’s a young guy, but he’s really knowledgeable about basketball and knows all of the players, even in Summer League. Frankly, I couldn’t tell you the name of more than 3 guys on teams other than the Summer Spurs, but Bruno knew most of them and could tell me what their games were and their chances of making it to the NBA. We also had some great conversations about writing and life in general. Derrick White was a bright spot. He has a lot of polish and variety to his game and I expect him to contribute a lot to the upcoming season. 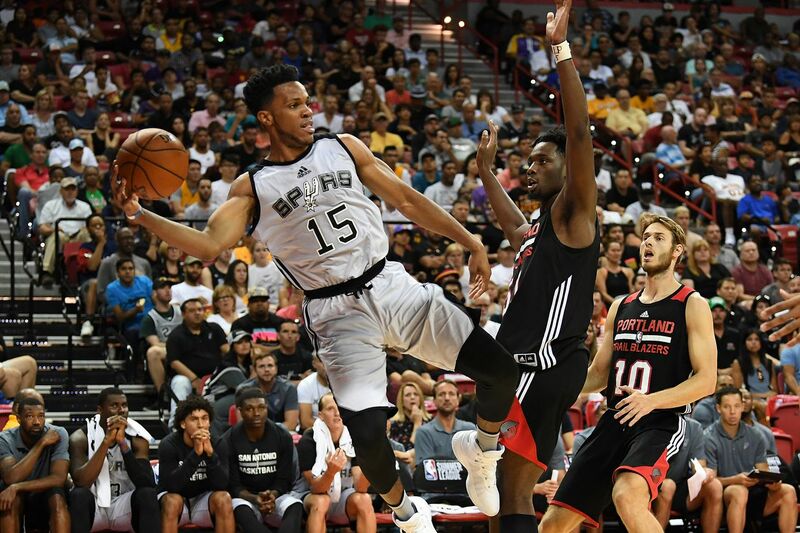 I think Bryn Forbes had a terrific Summer League, and has grown a lot since last year in terms of having a more complete game. He’s no longer just a shooter, he can also create off the dribble, and he was vocal in leading and coordinating the defense, and he’s much improved at staying in front of man on defense. Having said that, I don’t know if he’s going to be in the rotation for the Spurs. But he’s definitely a roster player. Dejounte Murray didn’t look good in Summer League, but as young as he is, I think he’s probably due for some inconsistent play. I’m not worried about him … yet. Davis Bertans is a good player, but maybe the disorganized and chaotic play of Summer League isn’t the best kind of style for him to play. Some other guys like Whittington have impressed me with their effort, but not enough skill to be an NBA player. And Ledbetter is fun to watch, even if he has zero chance to make an NBA roster.